3D printing has been around for several years, but, up until recently, it has not infiltrated the construction industry. China has printed a few buildings and a 3D printed house in the Netherlands is currently under construction, as well. Now, the United States is getting into the 3D building mix, with New York City architect Adam Kushner and his partner, Enrico Dini, who runs the 3D printing firm D-Shape. Kushner and Dini plan to build a massive 3D printed pool and awnings in a quiet, 5 acre plot of land in upstate New York, which they plan to complete by the end of 2015. In the future, the team plans to add a large 3D printed home next to it. 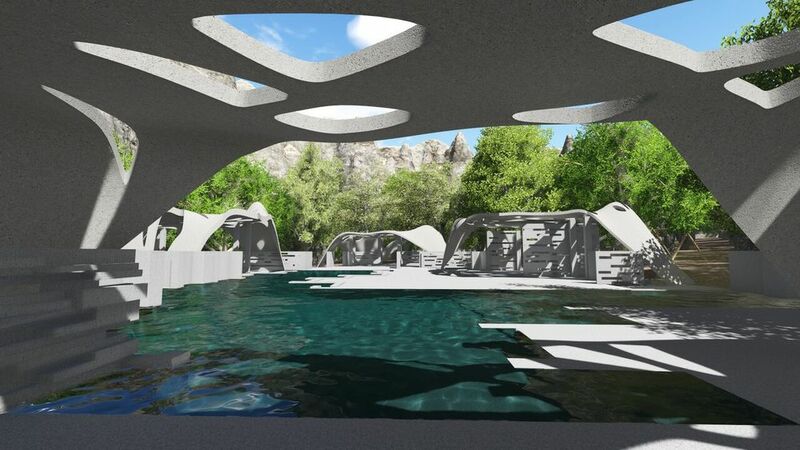 The pool, which measures 75' long and 65' wide at its largest points, will be the first 3D printed structure of its kind in the United States. Also planned in the area are multiple changing rooms, a hot tub, and a wet bar. According to D-Shape’s website, the material used to create the structure is artificial sandstone that “transforms into a marble-like material” and has superior resistance and traction than Portland cement. They estimate the 3D printing process to be 4 times faster than traditional building methods and they claim the costs to build structures are 30-%-50% less. The printing machine is quite massive and the video below shows how the machine operates. According to CNN, the printing machine is currently stuck in Italy and they will need clearance from the military to export it to the United States.